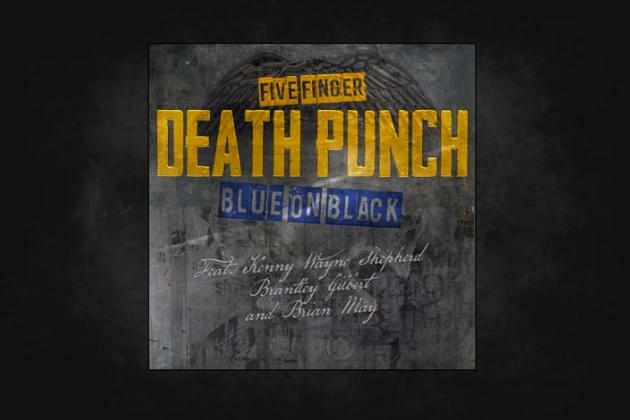 Ivan Moody and Five Finger Death Punch have just released a new version of their cover of the Kenny Wayne Shepherd song, “Blue On Black”, and this time around, they’ve added some sizzle to the recording. Along with Five Finger, the band jumped in the studio with Rock and Roll Hall Of Fame Guitarist Brian May, yes, that Brian May, of QUEEN, and, the originator of the song, Kenny Wayne Shepherd, also jams on the song. And, to show unity, Country singer Brantley Gilbert also provides vocals on the song. So, why did they do the song, again? The song proceeds are going to the Gary Sinise Foundation, which supports First Responders, America’s Defenders-veterans, their families and those in need. A worthy cause for sure. The artists have also produced a video to go with the song. Check it out, new Rock, for a Cause, tip of the hat to Five Finger, and this awesome collaboration!